With the emergence of online communities, many financial services companies are looking at ways to build and capitalize on their own community aimed at targeted groups. 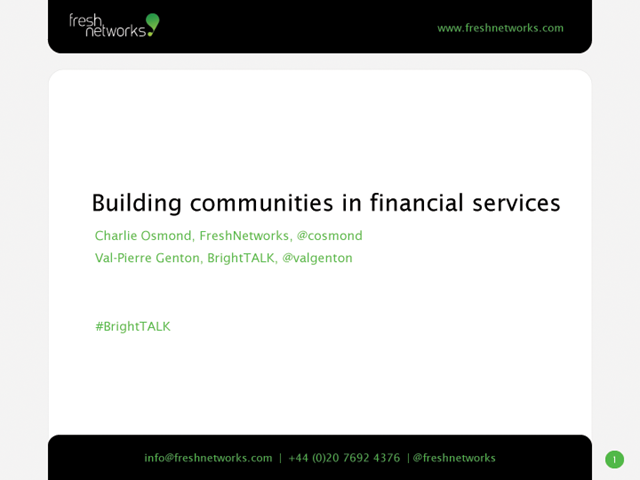 Join Charlie Osmond, CEO of Fresh Networks and Val Pierre Genton of BrightTALK™ as they present “How to Build an Online Community in Financial Services”. You will learn how to strategically build an online community relevant for your financial services audiences and learn how to use appropriate metrics for tracking and ROI.